Flashing Check Engine Light – Pull Over! For many drivers, a check engine light can cause instant panic. There are many reasons for this dashboard warning light to appear. That means uncertainty – what is the problem, how bad is it, and what should I do? 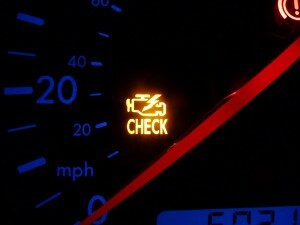 Don’t Ignore a Check Engine Light! This warning light appears for a reason, and ignoring it could lead to much more extensive damage, in some cases causing thousands of dollars in engine repairs. But addressing early could instead mean simple maintenance. Our auto repair experts can diagnose the problem and get you back on the road safely – call our Littleton auto repair shop at 303-347-1010. If your check engine light is flashing, find a safe place to pull over as soon as possible. Flashing warning lights should be taken seriously. Flashing usually indicates a problem where the safety of the vehicle could be at risk. Shut off your vehicle and have it towed to a trustworthy auto repair shop with certified technicians, up-to-date training, and proper equipment, like Keller Bros. Auto Repair. The same is true for other warning lights on your dashboard. A tire pressure light may indicate that the tire needs more air, but if the same light starts flashing you may at risk of a flat tire. Dashboard lights are designed to warn a driver about issues with their vehicle. While it may not always be clear to you what caused the light to appear, it is clear what you should do – take your vehicle to your reliable auto repair shop, Keller Bros.
Our experienced technicians use up-to-date technology to interpret the computer code that triggered the warning light, but our diagnosis doesn’t stop there. With training and expertise, our technicians will perform an inspection on the vehicle to perform additional diagnostics if needed. This lets us confirm the problem and recommend services to fix it right the first time. When the check engine light or other dashboard warning light appears, bringing your vehicle into our independent auto repair shop for an inspection helps you catch and prevent costly issues. That means you’re able to keep your vehicle running smoothly and get more miles out of every dollar! Our ASE-Certified technicians are here for you – If your check engine light is on, give us a call at 303-347-1010. We’ll diagnose and fix the problem to get you back on the road!